Portulaca grandiflora is an annual. What makes annual plants "annual" and perennial plants "perennial?" Well, the answer lies in their respective life cycles. "Life cycle" means the amount of time it takes a plant to grow from seed and end up, finally, bearing seed of its own. You place the seeds from last year's flowers in the ground in spring. New annual plants sprout from the seeds. With proper care, during the course of the summer, these produce flowers. Toward the end of the growing season (late summer or early fall), annual flowers yield seeds, signaling to the plants that their life cycle is complete. Having achieved their reproductive mission, they will die when the first hard frosts of autumn arrive. But in many cases, if you practice deadheading on them during the summer to foster reblooming, you can get a lot of value out of them as fall flowers in the early part of autumn. Deadheading, you might say, tricks a plant into blooming a little longer than its natural life cycle would call for. Thus the difference between annual plants and perennials. Perennials grown from seed usually do not produce flowers in their first year (nor do biennials). That is, they have a longer life cycle. Perennials make up for being slower to reproduce by flowering more than one year. Be that as it may, some are short-lived, lasting only three years, including columbine and lupine. However, if such a short-lived perennial spreads (whether by seed or through underground rhizomes), you may not even notice the death of the original plant, as its offspring will replace it. 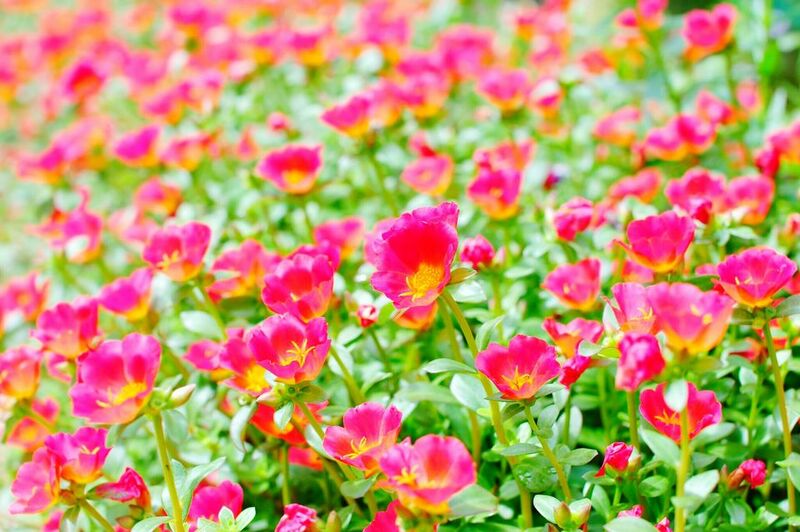 Some annuals, too are self-seeding and may reappear year after year, such as Portulaca grandiflora. Some plants that are perennials in their native lands (for example, in the tropics) are treated as if they were annuals in colder regions (which is, in fact, how they function there, not being cold-hardy). Here, one might say that function trumps botany. For example, lantana plants are really perennials, but they are treated as annual plants in regions far to the north of their native lands. These regions are too cold for them to survive the winter. They are raised in heated greenhouses until they flower, at which time they are sold to the gardening public. The root in both words, "annual" and "perennial" (that is, per-annual) is the Latin word for "year," annus. Annual plants are thus those that last for a portion of but a single year (even in their native climates). Perennial plants have something extra: that "per" in their name. The per-prefix in Latin adds to what comes after it. So perennials, given the proper conditions, will live extra years, when compared to annual plants. Or think of it this way: They persist longer. Which One Is the Better Deal for Consumers? Garden centers tend to sell perennials individually (in pots), while annuals are more commonly sold in six-packs. We call such annuals "bedding plants," because homeowners and businesses use them to create instant planting beds packed with colorful flowers. You will generally pay more for perennials than for bedding plants (but annuals sold in hanging baskets, such as fuchsias, also cost more than bedding plants). Annuals can be a great choice for a roadside flower bed where your goal is to have masses of eye-catching color all summer long. The reason is simple: They bloom for longer periods of time during the summer than do perennials, especially if you deadhead them (although some perennials do bloom longer than others). Perennials cost more not only because they offer more value (due to their longer life span), but also because nurseries invest more time and energy into growing them. Remember, perennials do not bloom during the first year of their lives, so nurseries are carrying them in stock and caring for them for a long period of time. It may be months or even years before they can sell them to the public. In the long run, it may be a better deal for consumers to buy perennials. Why? Because they do not have to be replaced as often as annuals do (assuming that you care for them properly). Some people who have been gardening for many years despise annual plants. This is understandable, as those proud of their gardening knowledge and skills will always be on the lookout for new things to try. They view most annuals as commonplace and trite. Oddball perennials that newbie gardeners have never heard of are more their style. That is their right, but when newbies hear such talk, they may wrongly be shamed into avoiding popular plants such as impatiens. The fact is, dirt-common or not, annual plants do have a place in landscaping. They inject quick, long-lasting color into the landscape in areas where, otherwise, one would find the dreaded empty spot. For example, you may have a spot in your flower bed that displays great color in spring (thanks to spring bulb plants, for example) but that looks rather boring once the spring flowers fade. At some point, you may be able to insert a new perennial here that will pick up the torch (sequence of bloom) and furnish floral color in summer. But, in the meantime, annual plants may be just the solution to cover up the gaping hole. What's the Difference Between Perennials and Annuals?